Have you ever tried spray painting MDF boards? I'm sure it's an unpleasant experience. MDF (Medium Density Fiberboard) is generally a great choice for many building projects. MDF is actually the most popular fiber material out there, and for a good reason: it is more affordable than high-density boards, yet more affordable than low-density ones. Now, why is spray painting MDF boards an complicated process? Because, MDF boards with their medium density is porous. So, it's hard to even out the finish when we are using a spray paint. If we spray too much in one area, the MDF board can easily swell, especially if you are using water-based paint. So, generally brush painting it a better idea, but it will take more time and effort. Yet, spray painting MDF boards is not an impossible task, and here we will share several tips to help you. One of the biggest disadvantages of MDF is the fact that it is made with chemical substance called urea formaldehyde. Although it is not generally hazardous for humans, it can cause allergic reactions, nose and eyes irritations, and difficulty in breathing. So, make sure to wear a protective mask or goggles when sanding or cutting MDFs. We have mentioned that the main concern on spray painting MDF is the porous nature of the fiberboard. The solution? By priming the MDF before spray painting, we can avoid the swelling issue. This way, your finish won't crack,bubble, or distort. Keep in mind that the edges of MDF are more porous than the top or bottom surface, so you should pay more attention during priming. 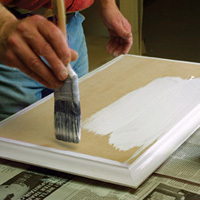 You can generally use any type of primers to prime an MDF. However, avoid water-based ones to prevent swelling and distortion. Lacquer primers can help emphasize the color, so it might be the better choice if you are looking for awesome finish. Remember that different types of primers require different time to dry up. So, depending on how much time are you willing to invest, you might want to choose a primer that dries up faster. Another common issue with spray painting MDF boards is the smoothness. So, it is a good idea to sand the MDF before priming. If you need the extra smoothness, you can also sand the MDF after applying primer, and then apply another layer. An 120 grit paper is adequate to do the job. As mentioned, it is advised to wear protective math and goggles during the sanding process. Also, make sure to clean all dusts and debris before applying primer. You can either use a spray can directly, or use a paint sprayer, depending on the size of your project. Generally a smaller spray tip will give better results, but will take more time to finish. If you prime the MDF properly, as discussed above, the spray painting process it relatively easy, and you shouldn't have much issues. Remember to avoid exposure to moistures during the drying process.